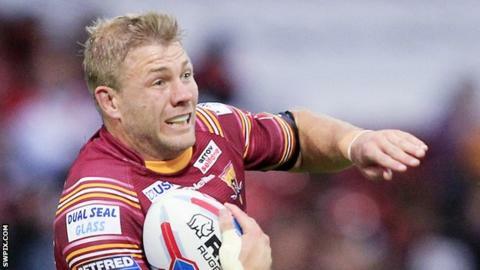 Huddersfield Giants forward Ryan Hinchcliffe will retire at the end of the season and return to Australia, the Super League club have announced. The 33-year-old joined Huddersfield from National Rugby League (NRL) side Melbourne Storm in 2016. He has made 86 appearances for the Giants, scoring 12 tries for the club. "He's one of those guys that lead by example on and off the field and he's certainly going to be a loss for us next year," boss Simon Woolford said. The Huddersfield head coach added: "His attitude towards his footy is second to none, but he's also pretty switched on. "He's the ultimate professional. I've known him a long time since we played together back at the Canberra Raiders in the early 2000s and he's worked hard his whole career." Hinchcliffe began his career with Canberra and went on to join Melbourne Storm in 2009 before moving to England seven years later. Giants currently sit fifth in the Super 8s table but are six points behind fourth-placed Warrington Wolves, with just four games to play, in the race to reach the Super League semi-finals.